High in the Arctic, this bird takes to the skies! 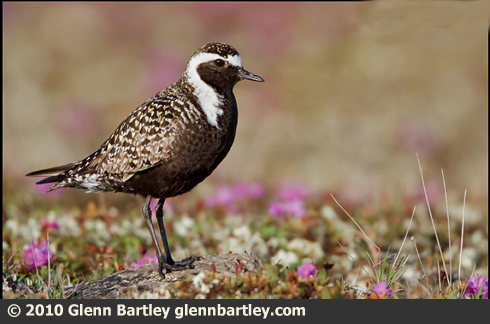 A male American Golden-Plover proclaims its nesting territory with an aerial display known as the "butterfly flight." After flying up 50 feet, the plover switches to slow motion, raising its wings languidly until the wingtips nearly touch over its body, then lowering them gradually until they almost touch below - all the while calling. The plover sustains these slow and exaggerated wing-beats for nearly a minute - hanging in the air like an enormous butterfly. On a June day, a broad stretch of Arctic tundra sparkles with color. The low greenery, ankle high at most, is interspersed with white stones clad in orange and black lichen. A Lapland Longspur sings its gentle song. This peaceful spell is suddenly broken by another bird taking flight. [Loud “Repetitive Calls” of American Golden-Plover] It’s a male American Golden-Plover, a slender bird with a two-foot wingspan. It’s entirely black on its underside, but its back gleams like polished gold. It’s proclaiming its nesting territory with an aerial display known as the “butterfly flight." After flying up 50 feet, the plover switches to slow motion. It raises its wings languidly over its body until the wingtips nearly touch, then lowers them gradually until they nearly touch – all the while calling. The plover sustains these slow and exaggerated wing-beats for nearly a minute – hanging in the air like an enormous butterfly. Finally, holding its wings upright in a narrow “V,” it parachutes to the ground. For weeks, this scene plays out during endless Arctic summer days, as golden-plovers tell their neighbors, like the Lapland Longspurs, [Lapland Longspur song] just who’s laid claim to this lovely expanse of tundra. Sounds of birds provided by The Macaulay Library of Natural Sounds at the Cornell Lab of Ornithology, Ithaca, New York. Song of Lapland Longspur 132125 and call of American Golden-Plover 137833 recorded by G. Vyn.